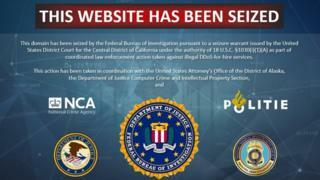 "DDoS-for-hire services such as these pose a significant national threat," US Attorney for Alaska Bryan Schroder said in a statement. The services advertised their ability to find individuals' net addresses so the data barrages could be tightly targeted. "Booter sites are dangerous because they help lower the barriers to cyber-crime, allowing even complete novices to launch sophisticated and crippling attacks with the click of a button," said cyber-security expert Brian Krebs in a blog. The FBI had help from the UK's National Crime Agency and the Dutch national police force, as well as tech firms Cloudflare, Flashpoint and Google, when investigating who was behind the 15 domains.